If you were a globetrotting landscape photographer and could only take one more breathtaking image, where would you go? What would you shoot? Maritime seascape? Remote desert scene in Africa? Burning lava flows in Hawaii? 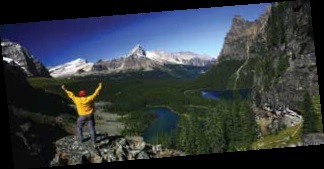 For many “shooters,” the answer would be a majestic, postcard-perfect scene in the Canadian Rockies. Indeed, the baby-blue lakes, rushing rivers, and jagged, snow-dusted mountains in Alberta and British Columbia can make for the ultimate photographic prize. Perhaps the challenge, if you could only choose one location in the mountain parks, would be just that. Choosing just one! Here are five locations that would do just fine for your final postcard. 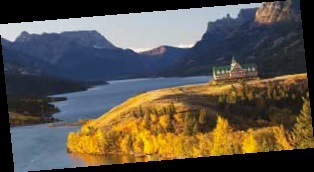 Lake O’Hara – Getting into the remote Lake O’Hara region – you need to be on the ball and book a seat on the bus (serviced by Parks Canada) or hoof it up the 11 kilometer road – is not a piece of cake. However, if you find your way there you’ll be rewarded. The region – peppered with lakes, tarns, cirques, crystal-clear streams, and soaring mountains – is as good as it gets. Hike the Opabin Plateau for some of the most stunning scenes your eyes will ever see…and your camera will ever shutter. 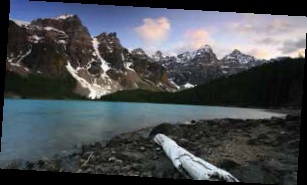 Moraine Lake – Good enough to be featured on the Canadian $20 bill for decades, the Valley of the Ten Peaks, as seen from the rock pile at the east end of Moraine Lake, is one of the most famous scenes in the Rockies. Capture this in the morning, when low-angled light paints the peaks, and you’ve got a keepsake to cherish. Include a red canoe, or two, in your shot to maximize the “Canadiana” effect. 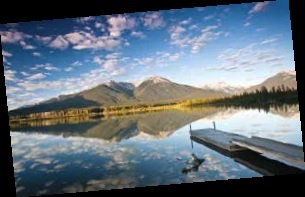 Vermillion Lakes – If you’re staying in Banff you don’t have to venture far to find some sweet scenes. The Vermillion Lakes Road serves up classic photo-ops that have been shuttered by thousands of visitors. True, you won’t be alone here, but the beauty of Mount Rundle reflected in the calm water of the spring-fed lakes is a shot every serious landscape photographer needs in their portfolio. 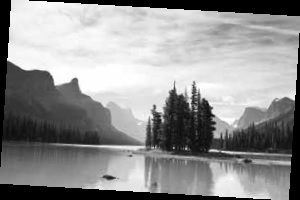 Spirit Island – Made famous thanks to an image capturing its surreal beauty was hung in Grand Central Station for over forty years, Spirit Island is the quintessential Canadian Rockies shot. The clutch of pines on the island, the lake, the mountains, it’s simply sublime. From Jasper, drive to Maligne Lake and take the 1.5 hour boat tour ($67 for adults) to reach the island and snag your shot. Unfortunately, it’s a quick stop so make sure you’re first off the boat! Or, better yet, take the “Through the Lens Cruise” ($145 for adults), a 2.5 hour late afternoon tour geared for photographers.